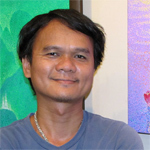 This impressionist painting by Innop is partly executed with the pointillism technique. 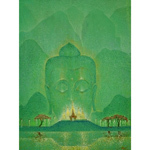 The scene depicts a golden temple and a Buddha's head illuminating the verdant environment. "Happiness can be found in practicing a calm way of life according to Buddhist principles. Beauty is generated in a simple way of life that is sufficient and sustainable. Detaching from lust reduces suffering and generates greater real happiness, leading to Nirvana," says Innop.